We interviewed 10-year-old actress Heather O'Rourke in Manhattan recently. In 1981, Heather starred as Carol Ann, the little blonde in "Poltergiest," who whispered "They're here." Heather is back, reprising her role in "Poltergiest II." Born in San Diego, she attends public school and is determined to be a success. We think she has a terrific future. Q. How did you get started in this business? A. When I was 5 years old, I was eating in the MGM commissary with my sister. Steven Speilberg came over to my table and asked me if I had ever been in the movies? I said no, and he asked me to come to his office for an interview. He asked me to read a script and cry and scream. He called me a few days later and said that there was something he really liked about me, so I got the part in "Poltergeist." Q. Have you done any commercials or modeling? A. I've done commercials for Rainbow Brite, McDonald's, Strawberry Shortcake and I did a picture for the First Barbie doll box. Q. What did you do between the two movies? A. I did some TV like "Happy Days" and "Webster," "Matt Houston." Q. What do you do in your free time? A. I read mysteries like Nancy Drew and Alfred Hitchcock, and I swim and I ride my motorbike. Q. How long did it take to make both movies? A. The first one took about 8 weeks, the second one took about 4 1/2 months. It took one month just filming the last scenes. Q. How do you manage to act so frightened? A. I pretend something scary is in front of me. Q. How did you fly? Was there a stand-in? A. I was on cables, but when we were in the car, they used someone else. They used a doll when I fall through the ceiling. Q. Do you keep any of the money you earn? A. My parents put everything in a trust fund for me. I won't get it until I'm 18, so I'll use it for college. Q. What's the most expensive thing you've bought? A. Probably my Panasonic typewriter. It can make graphs, it types in four different colors. Q. Is anyone else in your family in show bu siness? A. I have a 14-year-old sister named Tammy who is a singer and dancer. She's been in "Annie" and "Pennies From Heaven." A. Yes. I have a St. Bernard named "B." Q. Who would you trade places with for one day? A. Michael Landon or Sylvester Stallone. Michael directs and he's done so many neat things like "Bonzana," "Little House On The Prairie," and "Highway To Heaven." Sly is my idol. Q. Do you think there will be a "Poltergeist III"? A. There should be because the beast is not dead. She was young. She was shy. She was blond. She was sitting in a restraunt demurely downing a BLT on white when the bearded stranger approched her and offered her the chance to be in his next movie. Sounds familliar, right? And Lana Turner notwithstanding, pretty implausible, too. Nevertheless, 10-year-old Heather O'Rourke's start in showbiz is a replay of that old tale--the stuff of press agents' dreams. In Heather's case, the metaphorical soda fountain was the MGM commisary where she and her mother waited while her sister was dancing in Pennies from Heaven; the stranger was Steven Spielberg, and the film was the 1982's summer smash Poltergeist. As the tyke who's kidnapped by demons residing in the family's T.V. set, Heather turned in a performance that, according to New York Times' Vincent Canby, "ranks with the best work ever done by children in Hollywood." And her eeire annoncement of the poltergeists' arrival, "They're here," ranks with the most chilling lines ever uttered in a horror movie. To achieve anything less than her best bothers her. At four feet and 45 pounds, she looks young for 10, but she behaves like an older, much more serious child. Sitting with her hands folded, earnestly trying to correct things, she displays a demeanor harkening back to an era in which the average kid's wisecrack and back-talk quotient was much lower than it is today. Heather, in other words, has a pre-sitcom personality. "She's very professional," says her mother, Kathy, though professional is not the word to describe the nightmare Heather endured in Poltergeist. "The wind machine drove her ears crazy, she panicked when the room shook and she even wet the bed one time--Steven cleaned it up. But she wouldn't tell anyone she had to go to the bathroom. She'd just stand there doing a take, doing it until someone said, 'it's a cut.' "
Heather's grace under pressure has paid off. With some of the money from her films and a brief stint on Happy Days (as the daughter of Fonzie's girlfriend, played by Linda Purl), she's been able to buy a three-bedroom house in Big Bear, 120 miles east of L.A., where she lives with her mother, her sister, Tammy, 14, and her stepfather of two years, who sells all-terrain (three-wheel) vehicles. The home is an improvement over the Anaheim trailor camp where Kathy and her daughters were living a few years ago. That was after Heather's mother and father split up. "We had really rough times," says Kathy, who worked as a seamstress. The rough times don't show on Heather. Apparently well-adjusted, she's able to enjoy the spoils of her career without being spoiled. Her room is populated with 18 Cabbage Patch Dolls, and she has a shocking-pink telephone and a canopied water bed. Her closet holds numerous self-sewn creations, and enough size-one shoes to make Imelda Marcos nostalgic. "I love the fashions of the '80s," Heather says breezily. "I like to take a lot of money--oh, $15--and just shop." 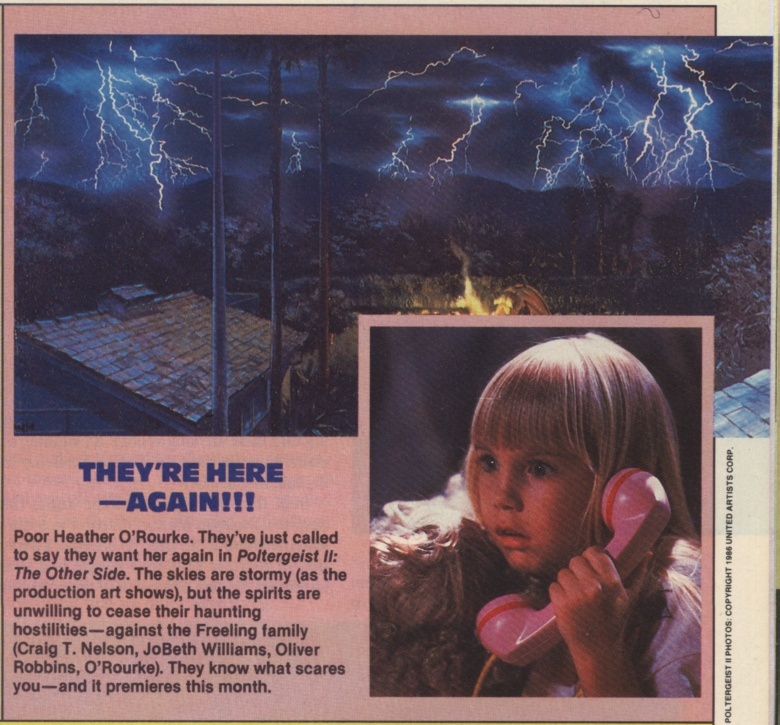 But Heather has different things on her mind now, such as the box-office performance of the newly-released Poltergeist II: The Other Side in which the ghosts come back to haunt the family in even more malevolent fashion. Then, there are other presures--reviews, investments, fans, fame, and a basic skills test that she and her fellow fifth-graders at Big Bear Elementary are going to take. Heather is concerned about her math. "It's not my best subject," she admits. Heather's prized possesions, however, are a Rocky IV jacket and an autogaphed glossy of Sly Stallone. "I met him working on Poltergeist II," she said. "He kissed my hand, and I thought, 'I'll never wash it again.' " But Heather quickly regains composure, making it clear that she plans to take control of her career. When asked whom she'd like to pattern her life after, she says, "Sylvester Stallone and Michael Landon." "Because they act and direct." "Poltergeist II: The Other Side," a sequel to the 1982 movie about a family whose lives are disrupted by unpleasant forces, cost $6.2 million more to make than the original even though it used the same cast and production values. The original "Poltergeist," co-written and produced by Steven Spielberg, was made for $12 million. The sequel has been produced for $18.2 million. "Steven was able to get a good deal for special effects from E.L.M. (Electric Light and Magic, George Lucas' wonder factory) which was in an idle period at the time," said executive producer Freddie Fields in explaining the leap in costs. "Inflation plays a big factor, the cost of materials as well as three union pay raises; also the additional cost of the cast." Michael Grais and Mark Victor, who co-wrote the original with Spielberg and are producing the sequel, took a calculated risk and wrote the new script for the same cast. They hoped it would win them over. It did. However, the actors and their agents wanted more money to repeat their roles. JoBeth Williams and Craig T. Nelson star as the parents and Heather O'Rourke and Oliver Robins play their children. "It was worth what we had to pay them," Fields said in an interview. "They're a very close-knit group; they really act like a family. That's something that isn't easy to achieve with actors." Spielberg is not artistically involved in "Poltergeist II," although the prolific filmmaker retains a financial interest. "We would have had to wait two years for his participation because he's so busy with other projects," said Fields. The first "Poltergeist" grossed $80 million worldwide, which would be reason enough for a sequel. However, Fields had other reasons for pursuing the project. "We have a strong script, one that goes beyond the first film to show you where the poltergeist came from. In other words, you'll see the genesis of the evil force," he said. "There was a big ancilliary audience for 'Poltergeist I,' people loving it on television and home video whereas they wouldn't go see it in theaters. They realized that it was not 'Friday the 13th,' but rather an occult mystery about the unknown, with even a touch of spirituality. I believe they will be eager to see the second film." Freddie Fields is in the curious position of being an independent producer at the studio, MGM, where he was once president and chief operating officer. Earlier in his career he was a superagent, co-founding Creative Management Associates and guiding the careers of Robert Redford, Paul Newman, Barbra Streisand, Woody Allen, Al Pacino, Steve McQueen and others. After selling the agency, he produced "Looking for Mr. Goodbar," "Victory," "American Gigolo," "Lipstick" and other films before becoming production chief at MGM. "The drawback to being an executive is that once you make the decision, a bunch of other guys go out and make the picture," he said about his return to producing. "The end result has slightly different colors, slightly different shades from what you originally had in mind. Because you have the responsibility for 12-18 pictures a year, you are necessarily at arms distance from the creative decision making. I'd rather be more closely involved." Besides "Poltergeist II," Fields has completed "Fever Pitch," directed by Richard Brooks and starring Ryan O'Neal. Next comes "American Anthem," directed by Albert Magnoli ("Purple Rain") and starring Olympic gold medal gymnast Mitch Gaylord. Speaking of poltergeists, how about the disappearing numbers on the script of "Poltergeist II." Since photocopying scripts of hot properties is a favorite Hollywood pastime, producer-writers Michael Grais and Mark Victor have come up with a tricky way of taking the fun out of it. Anyone who gets approval to look at the script must sign for a copy, and every copy is numbered.And, like the poltergeists in the movie, Grais and Victor have come up with a little black magic of their own. Each page is numbered with a wet-looking red ink or black ink. "If the ink is exposed to the very intense light of a photocopying machine," said Grais, "it will disappear. That's all I'm telling you." The producers of ''Poltergeist II: The Other Side'' have signed on Will Sampson, Julian Beck and Geraldine Fitzgerald for the horror film sequel which began shooting two months ago. Since last April, Williams has been steeped in the perils of Diane Freeling, reprising the role she played in ''Poltergeist'' as the supremely terrified wife and mother dealing with the forces of darkness. Williams, ordinarily a carefree brunette, is beginning to show the strain of going to work every day to face monstrous horrors from the nether world, worse than those encountered in the original film. The monsters, of course, are all special effects. And Williams is no more frightened of them than she is of the Snow White ride at Disneyland. But the high energy and nervous tension she must build every day to express terror and terminal fright is the most demanding and exhausting assignment of her career. Almost any actress can maintain high-tension terror for a few days, perhaps even a week. But it has been four months for Williams, who says it is taking its toll. ''Working under those conditions makes me not very pleasant company,'' she said with a wan smile. It was the noon break at MGM Studios and Williams was recovering from an especially emotional scene with ghosts in a darkened set. ''It really drains me to work at that high an emotional pitch so often. I come home totally wrung out. ''The way I work doesn't help. I use real or imaginary emotions that are so personal they become truly painful. I envision powerful images, like horrible things happening to people I love. It's very depressing. Why did Williams, knowing full well what she was in for, decide to play the role of the embattled mother a second time? ''When they asked me to play Diane again I realized I had a proprietary interest in the part,'' Williams went on. ''It was strengthened when I was told Craig (T. Nelson) and the kids would be coming back to play their roles. ''I'd have felt strange about another actress playing their mother. I really loved the Freeling family and I think we all brought that feeling to our roles, which made the picture so successful. ''Then I talked to friends about doing the sequel and they were all excited and enthusiastic about it. So I believe there's an audience out there anxious to see this film. After three years and the variety of characters she has played since ''Poltergeist'' was made, Williams found it difficult to get a grasp on Diane for the new picture. ''I had to familiarize myself with her again and go through the changes in her life since the nightmares she endured three years earlier,'' Williams said with a fleeting smile. ''We had to create a history for ourselves for the intervening years. The kids have grown a little and the family has moved many times. And Diane has to deal with the fact that she briefly had passed into another dimension and is living with the consequences of that horror. So is JoBeth Williams. She has another three weeks of stark, raving terror to go before she takes off for a European vacation to get away from it all. If ''Poltergiest II: The Other Side'' is a hit and a second sequel is made, will Williams again reprise her role? Williams looked as terrified by the suggestion as she ever did on the set. Quint: Where the sequels lesser experiences for you? Zelda Rubinstein: They were of longer duration and I liked doing the third one. I didn’t particularly enjoy the second one. I felt the late director Brian Gibson… my feelings were that he didn’t like me and he didn’t want to use me in the film, but he sort of had to, so I don’t know. Whatever happened, he’s not alive to state his views or defend himself, so I don’t want to bury him once more.